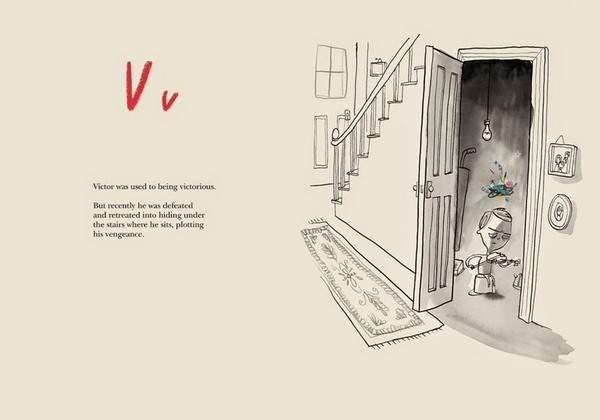 Seriously, the man is a picture-book genius. 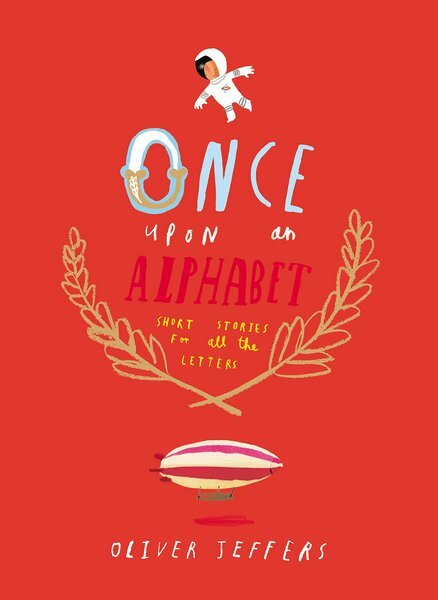 Yes, an original short story for all 26 letters of the alphabet. Some of the stories are funny; some are a little sad; some have a moral; some are pure, silly fun; some stand alone; and some are loosely interconnected. All of them are ace. It begins with A, ‘An Astronaut’, a story about astronaut-in-training Edmund, who has a rather career-limiting fear of heights. There’s a moral lesson in B, ‘Burning a Bridge’, and a tale of woe in C, ‘Cup in the Cupboard’, where a sweet little cup’s attempt to move from the cupboard to the sunny windowsill ends disastrously (and in many pieces). 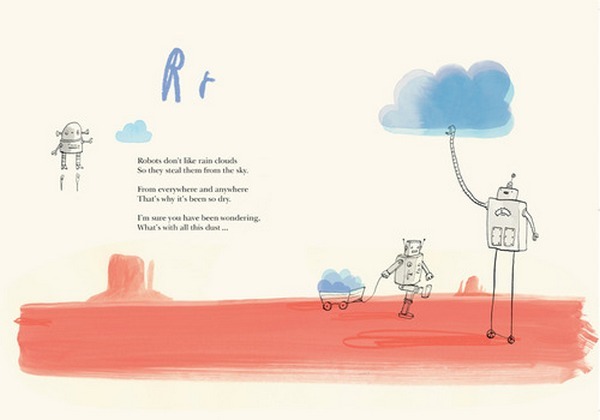 The book ends with Z, ‘Zeppelin’, where we revisit Edmund the astronaut, who has made some progress toward outer space. 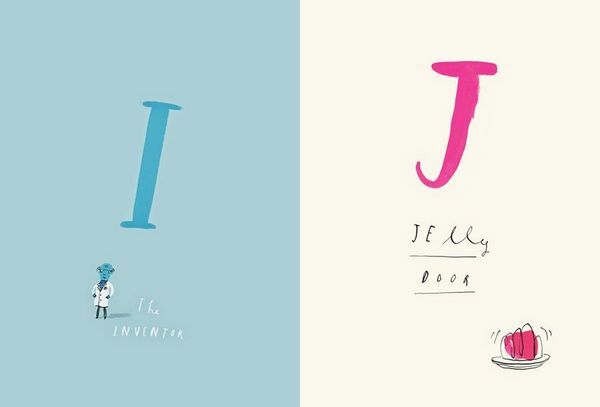 Four pages are devoted to each letter of the alphabet, beginning with a bold introduction page featuring the letter, the title of the story, and a small picture that hints at what lies ahead. It’s all done in Jeffers’ signature ‘hand-writing’ font and a restrained colour palette, dominated by muted reds, browns, greys and blues. Within just four pages, he manages to create excitement, humour, things to puzzle over and, most impressively, suspense. There are so many clever layers in this book, it’s hard to know where to start singing the praises. Part of the joy of these stories is the occasional reappearance of some characters (particularly Cup, an owl and an octopus, and a cucumber who felt his life would be better as a sea cucumber). Not only does it further their individual stories, but it provides a broader narrative that links up enticingly as you move through the alphabet – will Cup be put back together? Can the owl and the octopus solve all the problems? Is life better at the bottom of the sea? As well as these new and instantly loveable characters, some Jeffers favourites make an appearance (my seven-year-old squealed with delight when she spotted the penguin and the boy from Lost and Found). I think one of the things that I like best about Jeffers is the fact that he doesn’t pander to his audience with sentimental or soft stories. He recognises that kids can deal with (and like) the odd scary thing or the occasional horrid character. In the story of D, we meet Danger Delilah, a little daredevil who “…laughs in the face of Death and dances at the door of Disaster.” The illustration shows Delilah laughing and pointing at the grim reaper, who is saying “No one likes being laughed at you know!”, alongside additional illustrations of Delilah juggling knives and riding a donkey through a hoop of flames. Likewise, in the story for the letter H, ‘Half a House’, we are introduced to Helen, a woman who rolls out of the wrong side of bed one day and plummets into the sea. Neither of these stories are in the least bit frightening because children can recognise the absurdity in the illustrations. And as always, the illustrations are brilliant (I may be somewhat biased as I do have some of his drawings hanging on my wall. In the living room. Because Jeffers is not just for kids). This is Jeffers at his best. 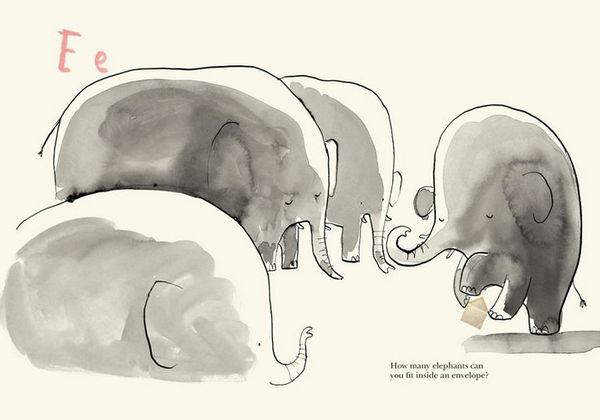 Once Upon an Alphabet is suitable for children aged three years and over. Find it at Book Depository, with free delivery to Australia.